Teri Kanefield is one of my new favorite authors. I have loved everything I have read that she has written. The story starts out very dramatic. 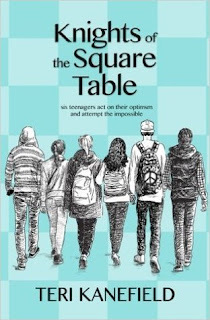 The Knights of the Square Table, a chess group is on a plane when it begins to experience problems. The plane crashes on a snowy island about 200 miles off course. The brief description of what people were experiencing on the plane was so realistic that I felt I was on the plane as well. The adults on this plane aren’t much help. It is up to these chess champs to keep them all alive until they are rescued. This is not the only problem they must solve. There is a problem of global proportion they must work on as well. Like all of her books there is usually something to be learned. I love the idea that my students will be able to see through this fiction that they can make changes in the world. After all, in our IB school we teach them to to be global students. I believe our students would be able to identify with these young people.